From September 6th to 7th, the 4th World Conference on Sinology co-organized by Confucius Institute Headquarters (Hanban) and Renmin University of China (RUC) was held in Beijing. Madam Liu Yandong, Vice Premier of China’s State Council, attended the opening ceremony and delivered a speech. In her opening speech, Madam Liu remarked that cultural exchanges between China and other countries could date back to ancient times. Over the past 400 years, China has established reciprocal relations with its international trade partners, spread Chinese classics worldwide and absorbed fine works from other cultures, and exerted impact on other countries’ customs and in turn been influenced by them. Generations of prominent sinologists have devoted their wisdom and strength to promoting cultural exchanges between China and the rest of the world as well as the harmonious coexistence and progress of different cultures. 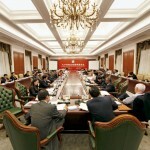 In the new era, China will put its cultural development and prosperity in an even higher strategic position. It will be inclusive enough to learn from other excellent cultures and contribute its due share to the cultural diversity of the world. Madam Liu noted that currently each country is unprecedentedly connected with and dependent upon another and that Sinology now plays a vital role in promoting cultural exchanges and friendships between China and foreign countries as well as in aiding China to be better understood. She hopes that the sinologists at home and abroad can strengthen their international cooperation and research, take an active part in the “Confucius China Studies Program”, step up to translate more Chinese excellent literature works, jointly train young talents and spread and share profound Chinese culture. She also said that people-topeople exchanges need to be deepened so that more foreigners can understand China and thus the Chinese and other peoples can enjoy friendships for generations. She added that since a full understanding of the meaning and value of different cultures is the prerequisite of the elimination of discrimination and misunderstanding, we should be tolerant and seek common ground with other countries in an effort to build a peaceful, flourishing and harmonious world. 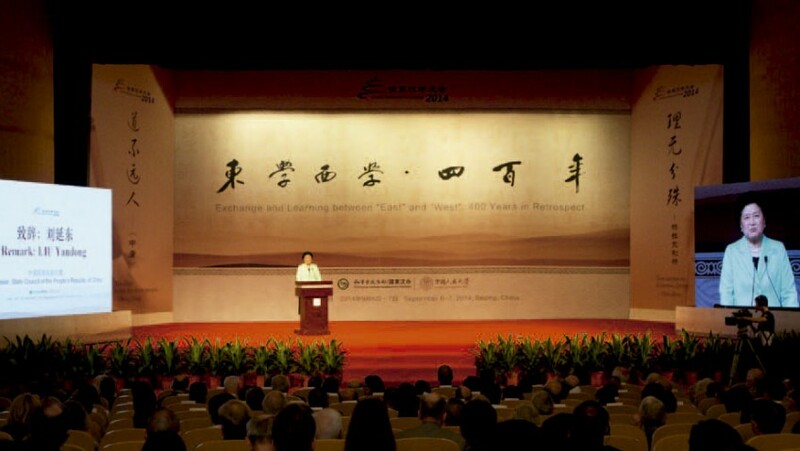 The conference features the theme of “The Exchange and Learning between ‘East’ and ‘West’: 400 Years in Retrospect”. Mr. Xu Jialu, Vice-Chairman of the 9th and 10th Standing Committee of the National People’s Congress and President of the International Society for Chinese Language Teaching, and Prof. Ezra F. Vogel, former Director of Fairbank Center for East Asian Research at Harvard University, delivered keynote speeches. In the two-day conference, a total of more than 200 experts and scholars from 38 countries and regions gathered and reflected from various academic perspectives on the past 400 years of exchanges and academic traditions between the East and the West. At the closing ceremony, Mr. Chen Yulu, President of RUC, announced that the World Sinology Conference Council, as the legal representative organization for the World Conference on Sinology, has been established with its headquarters at RUC. Twenty-five experts and scholars on sinology from all over the world will be the members of the Council, among whom 18 are from foreign countries and seven from China.